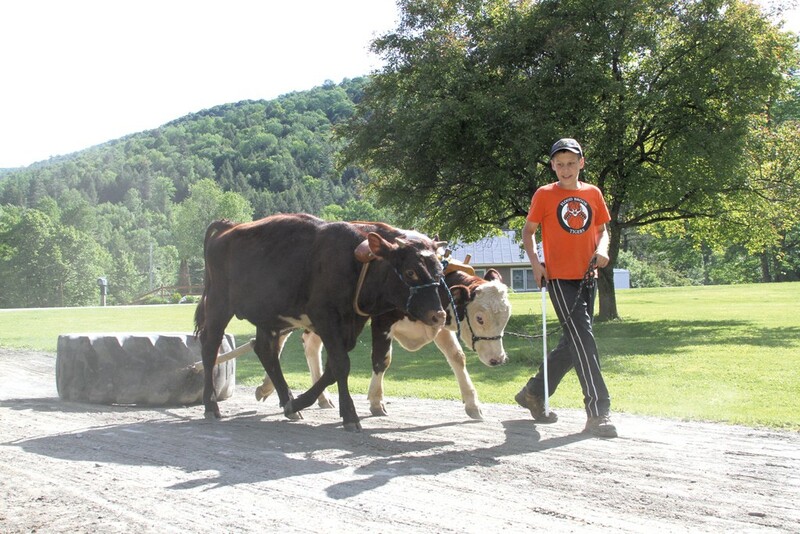 Ahead of the Herd: A Young Teamster Masters an Old New England Tradition | One to Watch | Kids VT - small people, big ideas! Drivers on Vermont Route 12 just south of the Barnard-Bethel town line slow down and sometimes stop at the sight of a slim boy in a baseball cap leading a pair of 600-pound steers, yoked, harnessed and pulling a giant tire up and down his gravel driveway. Five afternoons a week, 12-year-old Jacob Stone exercises his 10-month-old steers, Jack, a shorthorn, and Joe, a shorthorn-Hereford cross, born on the family farm. "Come on," Jacob sometimes says when he wants them to move forward. More often, he just makes a kissing sound, which means the same thing. "Gee" means turn right, "haw" means turn left, "whoa" is stop and "put in" means step in so you're parallel with the other steer. Jacob aims to complete five trips up and down the driveway — around three-quarters of a mile — stopping at each end to let the animals rest. That's when he catches the eyes of passersby. Last summer, a Canadian couple stopped to take his picture, then gave him $5 and drove away with a souvenir of an old New England tradition. Ox pulling started in the 1800s as a friendly competition among farmers, said Heidi Palmer, past secretary-treasurer of the Association of New England Ox Teamsters. Most New England fairs still host the contests. The 4-H program sponsors youth pulls judged on a host of technical skills. Professional pulls, the ones Jacob and his dad enter, have two types: distance pulls — in which teams compete to see which one can pull a load the longest distance in three to five minutes — and the six-foot-elimination, in which a team gets three tries to pull a load six feet in one continuous pull. Successful teams move on to a heavier load. Oxen, Palmer said, can pull up to 250 percent of their weight. Jacob and his 10-year-old sister, Paige, were born into hard work and dusty show rings. Their dad, Nick, grew up in the small town of Vershire. He started showing steers when he was 10, pulling at 16, and now competes in as many as 30 events a year. Nick's wife, Amy, who had nothing to do with oxen before meeting Nick, is proud to be part of an ox-pulling family. It gives her kids a unique childhood, she said. 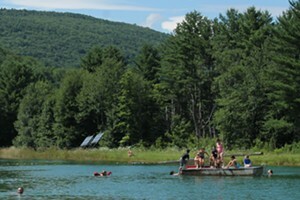 It teaches them commitment, compassion and patience, and it has introduced the whole family to friends throughout New England. "We planned the kids around ox pulling, if you can believe that," Nick said. The season runs from late May to early October and the goal was to have each baby at the end of the season, so they'd be big enough to travel to competitions the following year. Jacob, born Nov. 7, arrived right on schedule, but Paige, born Oct. 5, was not so cooperative. "I couldn't go to Sandwich (N.H.) that year," Nick said. Jacob and Paige were in the barn with their parents when they were two weeks old. They sat in infant seats in the milking parlor and then got pulled around in a red wagon as their parents finished chores. Nick and Amy gave each of their kids a bull and a heifer calf by the time they turned 5. Each child gets the money those animals bring in — and any calves the heifers eventually have. It's the Stones' way of building savings accounts for their kids, teaching them about money and instilling responsibility. Mom and Dad cover the 4:30 a.m. chores, but the kids help feed and water and clean the barn in the afternoons. The family no longer milks cows, but tends to 14 head of cattle, five barn cats, a dog named Sprocket and Paige's Shetland pony, Fred. The kids have to work their own steers. Jacob and Paige both competed in their first pulling competitions at age 5. Paige no longer pulls. Jacob took a five-year break, then resumed last year, winning five ribbons and taking his steers on a ferry to compete at the Martha's Vineyard Agricultural Society Fair. Joe and Jack are his third pair. Working them builds their strength and gets them accustomed to each other and to following Jacob's commands. "The three of them have to be a team," Amy said. The work pays off — in and out of the show ring. "Farm kids are independent, and they're problem solvers, and they're good leaders a lot of times," Amy said. Jacob calls out plays on the baseball field, said his assistant coach, Rebecca Ward. "He's just kind of a take-charge kid in a way that doesn't make you feel like he's trying to be your boss," she said. "He's my utility player. I can put him wherever ... and he gives me 110 percent." There is no such thing as a baby ox. Oxen are born bull calves. After they are castrated, they are called steers. Once they are trained to work and are 4 years old, they are called oxen.